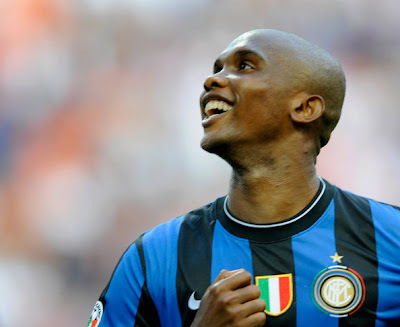 Inter forward Samuel Eto’o was often Diego Milito’s sidekick last year his first with the treble winners. The African forward usually played out wide on the wing and he often was the setup man to the big goal rather than the finisher in front of the net. And despite their great success last year as a club that won three big trophies, this year may offer Eto’o more of a featured role down the stretch of the season. Eto’o already has scored 11 goals this season and yesterday against Bundesliga squad Werder Bremen, the former Barcelona man would torch the defense for three goals in the center forward position. Eto’o moved over to the featured position due to a thigh injury that has plagued Diego Milito this year. Eto’o not only scored a hat trick in the game, but the red hot forward also set up the fourth goal of the match with an assist to Wesley Sneijder. Inter manager Rafa Benitez admitted that his African star was dangerous from any position you put him on the pitch. In the past Samuel has played in the middle and on the right. This year he has been playing more to the left and been getting nearer the goal. Tonight he played as the central striker and when he is near the goal he is always dangerous. And one of Rafa’s greatest challenges this season will be weighing such issues. Do you change up a winning formula from last season or do you hope that the previously designed scheme can continue to be successful? I think you have to go with the hot hand and if a particular player is playing great in a certain position then you should probably go with what is currently working. It’s a tough position for Rafa though, and at the end of the day he will be the one that has to answer such tough choices down the stretch. But regardless of the answer, Samuel Eto’o will always be part of the equation.